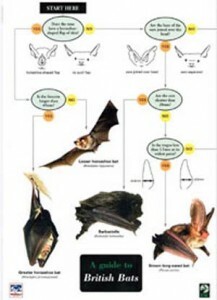 In order to conserve bats in Bedfordshire we need to collect as much information about them as we can. We are often approached by consultants for information about the distribution of bats in the county, and the more information we can provide, the better it is for bats, especially with the level of development being planned in the area at present. 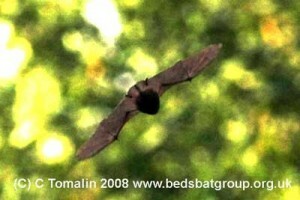 We are therefore keen to have ANY record of bat activity, in whatever level of detail you have available. One member’s observation that ” I have bats flying in my garden but they don’t seem to be like the other bats I’ve seen” led us to our first serotine record . Obviously the more detailed the information is the better it is for us. What information would we like? If you can give as idea of species so much the better- but even with a bat detector this can be hard to do, even sonogram analysis won’t always give us the answer. It would be very helpful if you could give us a contact number so we can phone to check interesting records. Our database only records locations as 6 figure grid references or post codes, not as individual addresses. How do I get this record to you? The easiest thing is to send you records to the bat recorder at bats@bnhs.org.uk. 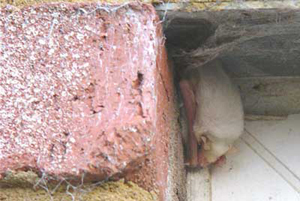 Albino Daubenton's Photo Our most unusual ever record of a Daubenton's bat is the one shown in the photograph below.We can't tell for sure if this is analino or leucistic animal ie does it lack all pigment or does it have pigmented eyes) This was e mailed to us by a member of the public.